The Ceres Zipslide Tour is the ideal breakaway for your company’s team building or year-end function. A load of family fun and an ideal activity for an awesome bachelors or birthday party. Ceres Zip slide Tour offers 8 slides, totalling a length of 1.4km – this is the best Zipline Tour in Africa! The amazing rock formations and river form a perfect backdrop to a fun-, adrenaline-filled adventure! The surrounding Skurweberg Mountains forms a picturesque backdrop to your journey. Safety is our Top Priority! We use a patented breaking system with some of the most modern modern equipment available. What a wonderful experience! Our 2 guides were incredible and explained everything very well, and m... - Lizl Kellerman. Book things to do at Ceres Zipline Adventures. 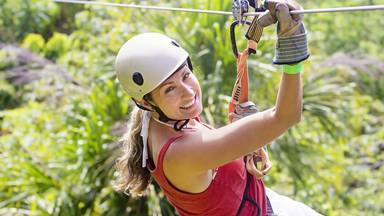 Find the best things to do at Ceres Zipline Adventures. What people say about Ceres Zipline Adventures. What a wonderful experience! Our 2 guides were incredible and explained everything very well, and make the experience even more enjoyable. Will definately do the zipslide again, and recommend to others.